The year 1967 was historic: It was the year of the world’s first heart transplant. There were race riots in Detroit. Polaroid cameras were all the rage as was Twiggy. The average annual income was $ 7300.00 while a house cost about twice that much. Gas was a mere 33 cents a gallon. It was also the year of our wedding. On the cheap. In August, not June. After moving from Lancaster, PA to Charlotte, NC, my teaching salary increased by only one hundred dollars to about $ 3500.00 stretched to pay for most of the wedding expenses. I was on a pay-as-you-go, no-credit-card system! Today’s Bridezillas would freak out at my teeny tiny budget for a church wedding. 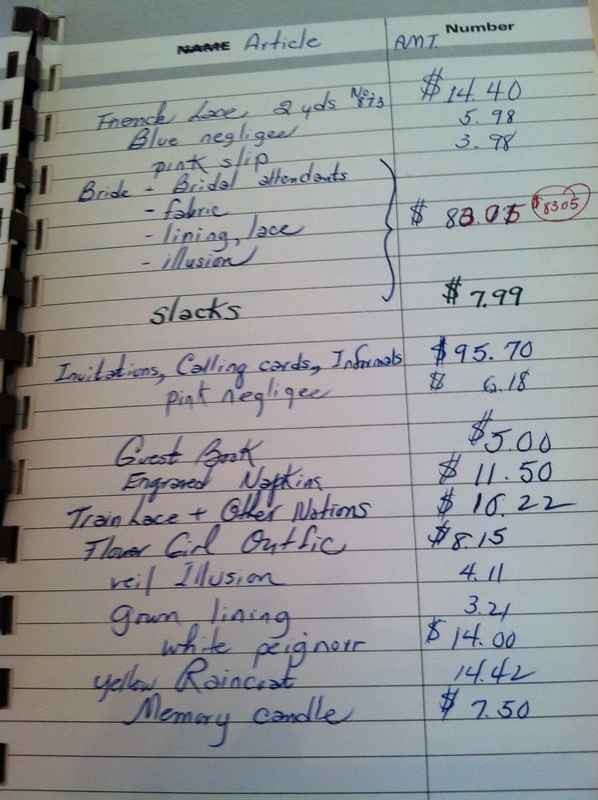 Ever the list-maker (call me OCD), I began my planning with a double-columned list: item + amount spent. The cake, flowers, napkins, photographer, and honoraria are missing here. Probably on another list! I was not very good at justifying my bank balance. I remember standing in front of a teller at Wachovia Bank unable to choke back tears at my overdrawn account just weeks before the wedding. January through May was consumed by pattern-buying, fabric-cutting and sewing a gown heavily influenced by Jackie Kennedy’s style. 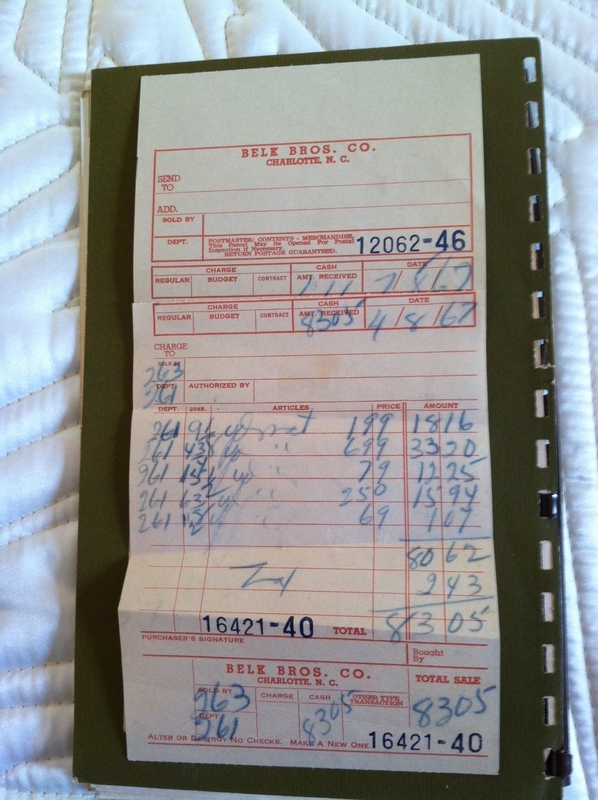 How is it that the fabric for the bridesmaids and the bride, including a train with appliques cost only $ 83.05 then? My hair was still in a bun but without the prayer veiling. One day in June, about six weeks before the wedding, I got the courage to dramatically change my hair-do. Off I went to a beauty salon, recommended by my roommates, to experiment with a bob. The stylist began, oddly, by braiding my hair into one long braid, almost waist length. And then she CUT IT OFF! I will never forget the sensation of hair still attached to my head swinging free. Was it in shock? Dancing? I’ll never know, but I do know the agony of trying to get my hands and fingers to contort themselves in odd ways to comb, brush, tease my shorter locks into the new style. Heaven only knows why I still have this hank of hair! Half the guest list were Mennonite friends and family from Pennsylvania, and they came to North Caroline in droves. Frugal Daddy gladly footed the hefty bill for the full course rehearsal dinner. Families from Charlotte Christian School put up my immediate family. Grandma and Aunt Ruthie were thrilled to stay in the home of Billy Graham’s mother, who had also hosted a bridal shower for me. Except for the bridal party, the wedding itself was a curious blend of plain and fancy: plain-coated, bow-tied Daddy with fancy bride. You may ask, “Why didn’t the groom help more with the wedding expenses?” A teacher/preacher at the time, he spent the summer as a rigger at the Jacksonville Shipyards carrying heavy chains on his shoulders up and down ladders trying to pay for the honeymoon and all that followed. No metaphor intended here! The summer months are traditionally wedding months, particularly June. 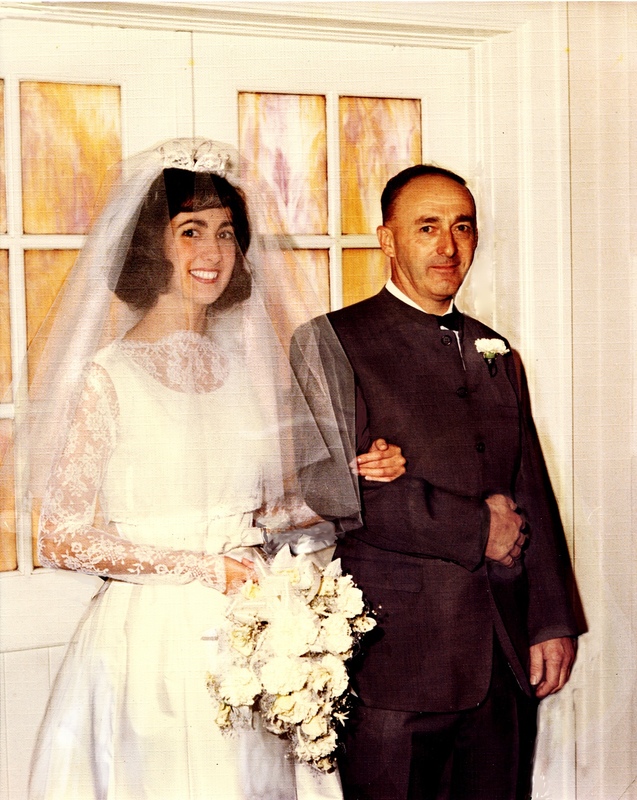 Do you have a wedding memory to share? Your own? Someone else’s? Like this post? Follow my blog and get many more free of charge! Just type in your email address at the top of the page and click “subscribe!” WordPress keeps your email address private. Your dress was absolutely beautiful! One day, in the not-too-distant future, I may have a future bride on my hands. I\’ll refer her to your list and tell her to work within that budget!! Almost everything on the list computed until I got to the \”yellow raincoat\” part! I nearly laughed out loud. My first thought was Niagara Falls. Why the yellow raincoat? Just curious. By the way, you have your daddy\’s eyes! He looked quite handsome in his suit. Did your mother make his suits? We went to Asheville, NC and the Smokies for our honeymoon in a pick-up with a camper in the truck bed–never could get that thing on the level–Argh! I notice a pair of slacks on my list too, something I had forgotten about. Thanks for the compliment, and no, my mother didn\’t make Daddy\’s suit. He got it at a plain coat store! What bridezillas don\’t know is that frugal is actually more fun. You were a beautiful bride, and obviously this wedding was a good start to a happy marriage. Grandma Longenecker had Victorian hair under a glass dome (her own? her mother\’s?) don\’t remember, but it struck me as a little grotesque as a child. Thanks to your link, I can explore further. A comment on keeping hair… My dad always kept a curled lock of my mother\’s beautiful Auburn red hair in his wallet. When I was a child, he would show it to me every once in a while, & tell me stories of how he looked at it often during the war. Sometimes, he would even let me hold it. Now, I still have that piece of my mother\’s hair, and it\’s a beautiful memory of my parents. I guess you get your romantic streak from your dad. Maybe the artistic bent as well. Right now we had pig stomach around the table at Mom\’s after a Father\’s Day message at Bossler\’s Mennonite Church. I used to think life is linear, but I\’m starting to see it as a circle. This generation could learn so much from operating on an actual budget. I get a charge from that show Say Yes to the Dress because brides will have a dress budget of $5,000. If the bride has the nerve to offer a mere $2,500 to her consultant, the boutique employee will frown as if she\’s going to have to dash down to Good Will to find something in that price range. My life/budget then was so far removed from the reality shows of today: Say Yes to the Dress and the different flavors of Housewives. It still is. How then do we find these shows entertaining–even soothing? When I am extremely tired, I find trash TV can put me in a neutral zone. Horrible to admit, but true. You (and your father) look beautiful. 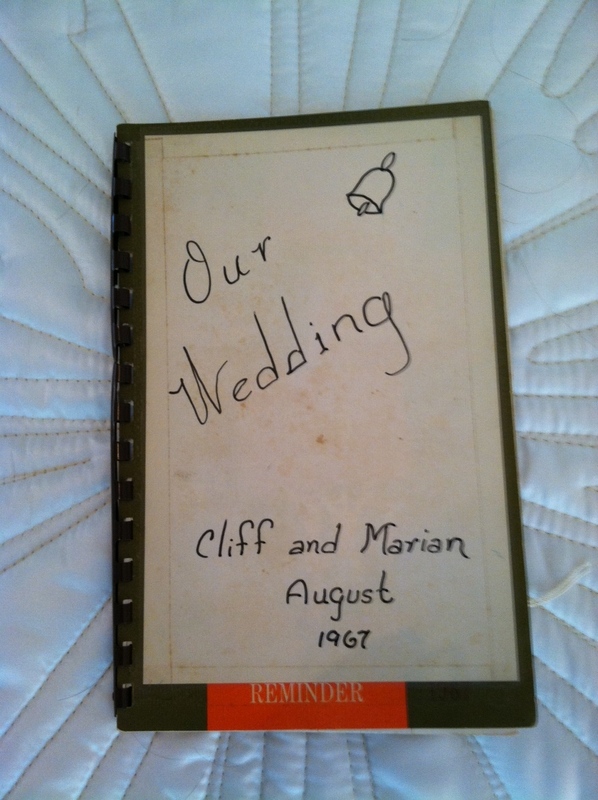 We had a budget wedding too as my husband was a mature student when we met and married. We booked the castle and the minister – everything else got added on only when we\’d earned the cash by working weekends! And I agree with Shirley that the frugality actually added to the fun. We had a lovely day out with my nephews gathering pebbles for the place cards and giggled all the way through our cake decorating disaster. 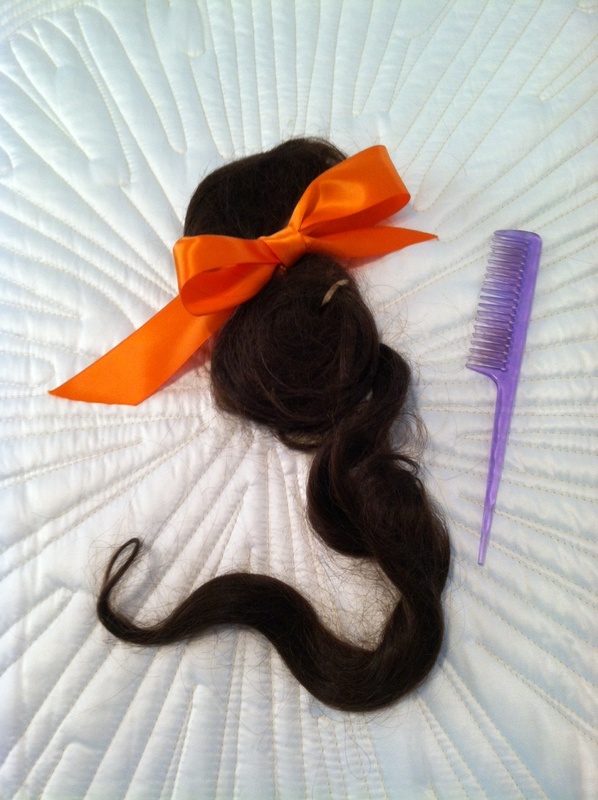 I can\’t believe you kept your hair all those years either but I\’m glad you did! The castle! Cause for pause here. I love the \”pebbles for place cards\” and \”cake decorating disaster.\” If everything went like clock-work there would be no story! Nobody wants to hear about all the cats that didn\’t get lost today. Speaking of castles, yesterday my husband and I saw a unique proposal (setting a castle in Cornwall) in the last episode of the Doc Martin series. We are British drama addicts, for sure. What a coincidence. Husband proposed on a Cornish cliff top – we\’d spent the day hiking and I was a bit mortified because I was really smelly and stinky! We were married in a Scottish castle near my husband\’s home town but spent the first seven years of our marriage in Cornwall (not in a castle, I hasten to add). Our castle was a ruin and they\’d only started doing weddings so it was ridiculously cheap – maybe 200 US dollars, including the minister! I understand the prices have gone up a bit since then though. So many good British dramas, but some damn fine ones from your side of the Atlantic too. We\’re currently enjoying some good Danish ones too. There\’s your hair. No photos of it still on your head though. You look happy and radiant as a bride. You and I both value old photos, that\’s for sure. And aren\’t we glad we have them for ready access to the memories we treasure? Thanks again for stopping by. There you go: Way more than you asked for, but since you asked . . . ! Thanks for sending me to this link from my wedding story. You were a beautiful bride. Your father reminds me of mine. I enjoy your blog. I haven’t been regular with mine. Oh, Lisa. I do sympathize with the hair cutting ritual. I cut my hair six weeks before the wedding and each hair stood out in shock. I was far from home and at age 26 my mother had little to say except “I’d rather have you be a happy Christian than a sad Mennonite” – ha! I admire your story of struggle with many accomplishments, and I am thrilled that you enjoy my blog. Yes, I was proud to wear it, but I was so poor (teacher’s salary, mind you) I didn’t have a choice. 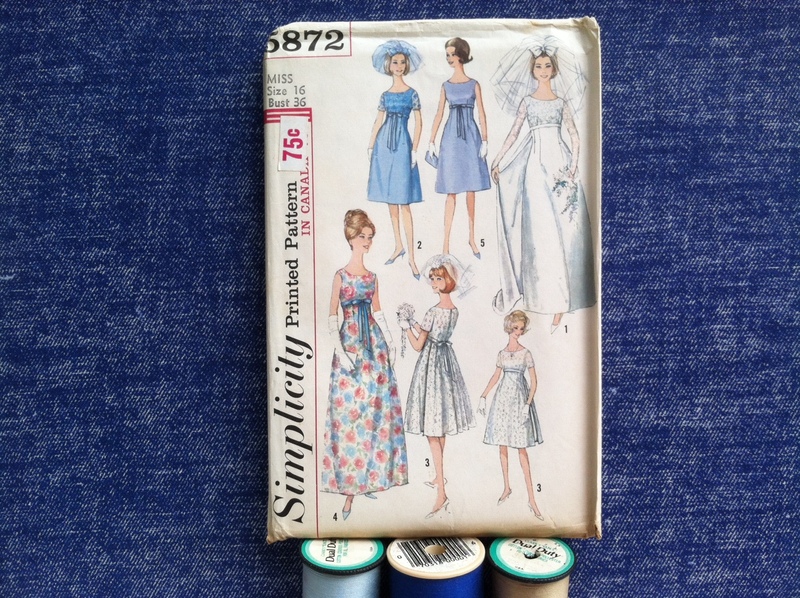 I have kept the pattern – ha! Did you keep the dress too? Yes and no! I kept the gown for awhile, shortening the hem to wear it as a fancy dress. I was a tiny bride, so when I gained weight it no longer fit. No, I don’t have the dress anymore, except in photos. Thanks for your interest, Fatima!